Lydia Stocker was the daughter of Mehitable Norwood (1756-1793) and Joseph Stocker (1745-1795), a Revolutionary War captain. She was born in 1785 in Lynn, Massachusetts, and had at least two siblings, John (1783-1815) and Zachus Norwood (1787-1849). 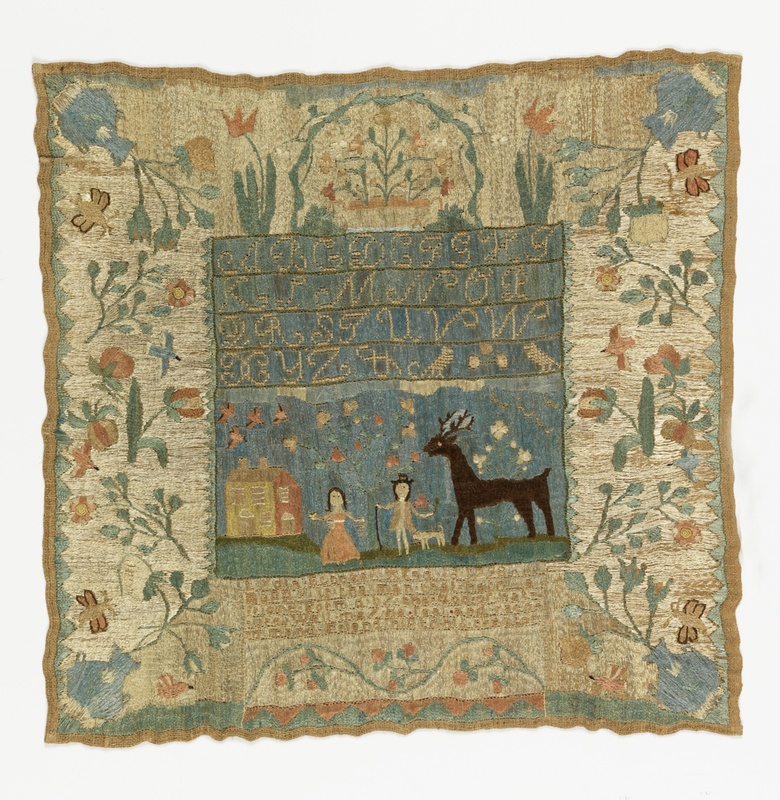 Lydia’s parents had both died by the time she stitched this sampler in 1798, at the age of thirteen. In 1806, Lydia married Nathaniel Olney Gowdy (1745-1825), who worked as both a shoemaker and a seaman. They had seven children: Thomas Gowdy (born 1808), Mehitable (born 1809), Lydia Ann (born 1811), Hannah (1812-1849), Nathaniel Thomas (1814-1865), Susan Elizabeth (born 1817), and Lydia Ann (born 1821). It appears that several of their children died young, including Lydia Ann, whose name was given to another daughter. Lydia’s husband died in 1825, a few years after the birth of their youngest child. A notice appeared in the paper several months after his death declaring his estate to be insolvent and announcing the appointment of commissioners to hear the claims of his creditors. When his estate was settled, Lydia was awarded the lower part of one half of a house, where she presumably lived with her children. She died in 1841 at the age of fifty-five. Although Lydia’s sampler resembles those of Salem, it was probably stitched in her hometown of Lynn. There are two related examples by girls from Lynn, Sally Breed and Sarah Newhall, that were also made in 1798. Sally Breed’s unfinished sampler is almost identical to Lydia’s. Both are solidly worked with wide borders of floral motifs, the corners of which are punctuated with flower pots. The central scenes include a couple and their dog standing in a landscape with a house in the background and a large deer in the foreground. The similarity of the Lynn samplers indicates that they were worked under the instruction of a local schoolmistress.